Four first-year eligible nominees, Larry Allen, Jonathan Ogden, Warren Sapp, and Michael Strahan, are among the 15 modern-era finalists who will be considered for election to the Pro Football Hall of Fame when the Hall’s Selection Committee meets in New Orleans, La. on Saturday, Feb. 2, 2013. Joining the first-year eligible, are eight other modern-era players, a coach and two contributors. The 15 modern-era finalists, along with the two senior nominees announced in August 2012 (former Kansas City Chiefs and Houston Oilers defensive tackle Curley Culp and former Green Bay Packers and Washington Redskins linebacker Dave Robinson) will be the only candidates considered for Hall of Fame election when the 46-member Selection Committee meets. Running Back … 5-11, 243 … Notre Dame … 1993-95 Los Angeles/St. 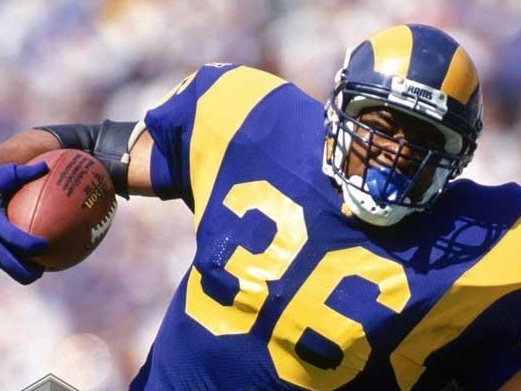 Louis Rams, 1996-2005 Pittsburgh Steelers … 13 seasons, 192 games … Selected by Rams in 1st round (10th player overall) of 1993 draft … Earned Rookie of Year honors … Finished rookie season with seventh best rookie rushing total in league history… As rookie finished second in rushing yards and third in total yards from scrimmage … First Rams rookie to rush for 1,000 yards since Eric Dickerson, 1983 … Rams leading rusher 1993-95 … Steelers leading rusher 1996-2001, 2003-04 … Steelers leader in total yards from scrimmage, 1996-2001 … His fifty 100-plus yard games ranks 1st in Steelers history … At time of retirement, his eight 1,000-plus yard seasons was tied for third-best in NFL history and his 13,662 ranked fifth all-time in career rushing yards … Ranked 19th all-time in combined net yards at time of retirement … Voted to Pro Bowl six times: 1994, 1995, 1997, 1998, 2002, 2005 … Named All-Pro in 1993 (AP, PFWA), 1996 (AP); All-Pro Second Team 1997 (AP); All-NFC 1993 (UPI, PW); All-AFC 1996 (UPI, PW), 1997 (PW) … Born February 16, 1972 in Detroit, Michigan. Defensive Tackle … 6-2, 265 … Arizona State … 1968-1974 Kansas City Chiefs, 1974-1980 Houston Oilers, 1980-81 Detroit Lions … 14 seasons, 179 games … Selected in 2nd round (31st player overall) in 1968 draft by Denver Broncos … Denver attempted to switch him to offense before trading him to Chiefs during training camp … Fit in perfectly with Chiefs’ dominating defense … Member of team’s Super Bowl IV championship team in second season, … Started at left defensive tackle in Super Bowl win over Vikings and registered three tackles, one assisted tackle … Dealt to Houston Oilers in blockbuster trade during 1974 season … Key veteran leader with 11.5 sacks to help Oilers to 10-4-0 record in his first full season with club … Winning record in ’75 was Oilers first winning season in eight years and just second in 13 seasons …. Named NFL’s Defensive Player of the Year by Newspaper Enterprise Association, 1975 … Culp led defense that helped Oilers earn back-to-back appearances in AFC championship game, 1978-79 … Named All-Pro, 1975 … All-Pro Second Team 1971, 1977, 1978, and 1979 …. 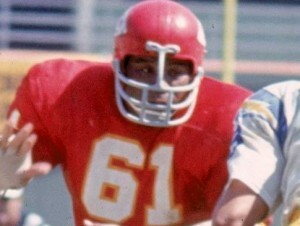 First- or second-team All-AFC five times … Elected to six Pro Bowls … Born March 10, 1946 in Yuma, Arizona. 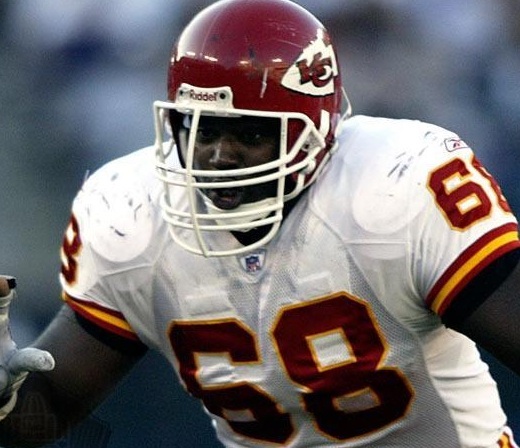 Guard … 6-3, 320 … Nebraska … 1993-2006 Kansas City Chiefs … 14 seasons, 224 games … Selected by Chiefs in 3rd round (74th player overall) of 1993 draft … Placed into lineup in first NFL game after starting left guard suffered injury … Next week was inserted as starting right guard … Started every game from that point through retirement … Never missed a game during 14-season career, 224 games played, 223 starts are franchise records … As rookie helped Chiefs to an 11-5-0 mark and AFC Western Division crown, first division title for team since 1971 … Chiefs won four division titles and made six playoff appearances during Shields’ career … Earned 12 straight Pro Bowl berths … Named first-team All-Pro in 1999, 2002, and 2003, picked as second-team All-Pro four times … Was All-AFC seven times including each of final six seasons … Chiefs led NFL in total yards gained in 2004 and 2005 and topped AFC in that category in 2003 … Led NFL in points scored in 2002 and 2003 highlighted by running back Priest Holmes’ then-record 27 rushing touchdowns in ’03 … In 1994, Chiefs offensive line established a franchise record allowing a mere 19 sacks … A member of the NFL’s All-Decade Team of the 2000s … Joined Hall of Fame linebacker Derrick Thomas in 1999 as only active players named to Chiefs’ 40th Anniversary Team … Born September 15, 1971 in Fort Riley, Kansas. 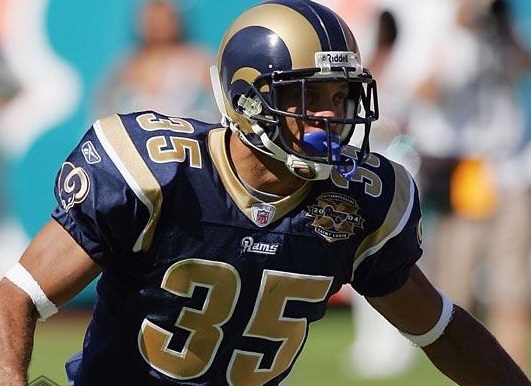 erback/Safety … 5-11, 194 … Southern University … 1991-2000 Phoenix/Arizona Cardinals, 2001-04 St. Louis Rams … 14 seasons, 211 games … Selected in the 3rd round (59th player overall) of 1991 NFL Draft … One of finest defensive backs ever … Starred at cornerback for first 12 years of career before moving to safety … Earned Pro Bowl nods at both positions, seven times at cornerback and once as safety … Had first career pick and four deflected passes in NFL debut … Finished year tied for most interceptions in NFC with six, also recorded 17 passes defensed, 48 tackles … Named NFC Defensive Rookie of the Year by NFL Players Association … Earned Pro Bowl nod and All-NFC acclaim for first time in 1994 when he added another conference interception title with career-high nine interceptions … Named first-team All-NFC 1995, 1996, 1997, and 2001 … Selected to NFL’s All-Decade Team 1990s … Recorded interception in every season but last and had five or more picks in a season six times … Led Cardinals in interceptions seven times and Rams leading interceptor in 2003 … In all, registered 55 interceptions for 807 yards … His nine pick-sixes tied him for second all-time at time of retirement … Shared NFL record for longest fumble return in upset victory over Redskins Nov. 5, 2000, 104 yards for a TD … Recorded interception in record four straight postseason games during span from 1998 to 2001 … Started at left cornerback for St. Louis in 2001 NFC Championship Game and Super Bowl XXXVI … Born January 29, 1968 in New Orleans, Louisiana.